Royal Wolf provides a cool solution for Marks Quality Cakes To invest in a new head office, or not to invest in a new head office - that is the question many businesses ask themselves when in a period of rapid growth and expansion. For many hospitality companies, this includes additional cooling requirements. While this juggling act can make some a little frosty, many savvy businesses are investing in a long-term cooling solution from Royal Wolf, Australasia’s largest supplier of shipping containers. 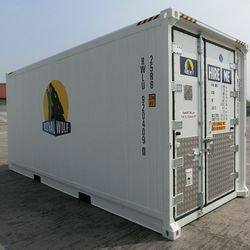 Royal Wolf’s cold storage and refrigerated containers are available in three sizes (10, 20, 40ft), thermostatically controlled and can include a range of alarms, digital displays and Ezi Enta doors. These units are reliable, portable and provide a cost effective solution to storing a surplus of food and beverages. Marks Quality Cakes in Victoria, have experienced a period of growth, including expansion into other states. They required a long term solution that not only provided additional storage, but was tailored to their specific needs as one of Victoria's leading cake manufacturers and suppliers. The three 20 ft refrigeration units onsite at their head office have specialised shelving to perfectly store an array of cakes. Royal Wolf Melbourne sales executive, John Hutchings, said the refrigeration units offer a flexible storage option that can be tailored to a number of hospitality businesses no matter the size or scale of their requirements. “Our refrigeration units are great for the events but more and more companies are utilising them on a long-term basis. For catering and hospitality businesses, they see benefits given they are easy to operate, cost effective and secure,” said Hutchings. Tony Waldner, General Manager of Marks Quality Cakes, added: "With our growing business the additional refrigeration was necessary to helping us succeed. It grew our storage capacity without us needing to find a new manufacturing site." Royal Wolf cold storage containers are constructed with 'food grade' stainless steel and aluminium interiors and are available in a range of sizes. Additionally, the containers are available for hire or sale and can be delivered direct to site.